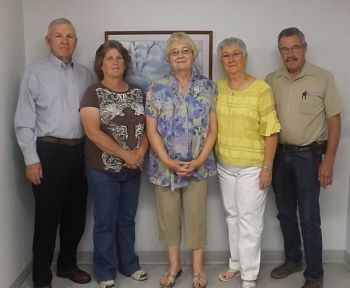 Left to Right: Jerry Houser (Chairman), Kristy Turner (Director), Lyla Day (Director), Laura A. Raybon (Secretary/Treasurer), and Ralph Bamber (Vice-Chairman). Elected to the Board in 1986, nominated as Board Chairman on May 15, 1990 and has presided in that position ever since. Mr. Houser enjoys spending his retirement from farming, and most recently a 2nd retirement when his wife Nila also retired and closed her Flower Boutique Business. They now enjoy travelling to see their son and his family in Louisiana. When not travelling they spend time with their daughter, her family, grandchildren, and great-grandchildren. Appointed to the Board on May 17, 2016. Mr. Bamber is a retired Computer/Business/Math teacher (Springfield High School). Since retirement Mr. Bamber has stayed active with a rural mail route and as a minister. Mr. Bamber and his wife Vicki enjoy dining out with friends and traveling to see their children. Elected to the Board in May 1990, nominated as and accepted the position of Secretary/Treasurer on May 19, 1992. Mrs. Raybon is retired from ranching certified Black Angus cattle. Laura enjoys quilting, singing in the church choir, her and husband Bill enjoy travelling, and spending time with their family, children, grandchildren, and friends. Appointed to the Board on May 18, 2010. Mrs. Day retired from SECHD where she worked in the Business Office from July 20, 1981 - March, 31 2008. Mrs. Day and her husband Kenneth enjoy spending time with their children, grandchildren, great grandchildren, and fishing. Mrs. Day also enjoys gardening and quilting. Appointed to the Board on May 17, 2018. Mrs. Turner worked for SECHD from April 17, 2003 - August 24, 2015 as a Radiology Technician and as the Director of the Radiology Department. Kristy has taken a break from radiology to help her husband Dwayne with their farming and ranching business. Mrs. Turner enjoys spending time with her son Trenton and his fiancé Shelby Bryant.